This massive bestiary for use with the Southlands campaign setting (but not limited to it) clocks in at 122 pages, 1 page front cover, 1 page editorial, 2 pages of backer-lists, 1 page ToC, 1 page SRD, 2 3/4 pages of advertisement, 1 page back cover, leaving us with 112 1/4 pages of content, so let’s take a look! I was a backer of the Southlands kickstarter, but am otherwise not involved with this book. My review is primarily based on the softcover print version of this book, though I consulted the electronic version to verify e.g. presence of bookmarks and similar components. This book is pretty much a sans frills experience – the brief version of this review would be as follows: After an introduction by Jeff Grubb, we dive into a ton of monsters; in the end, there is a table of monsters by CR; they span the breadth from humble CR 1/2 to massive CR 26. Yeah, I know, not very fulfilling now, is it? Let’s try to do this more justice: We have, at this point, seen more than one book (or chapter) on creatures of the deserts – there usually are a couple of undead, some ambush predators, a killer scarab, the like. We know the tropes and this book very much is aware of this – instead of simply resorting to trying to re-invent the wheel, it pretty much says: “So yeah, you do – but guess what? You haven’t seen THIS done!” What do I mean by this? Well, for one, the massive book has something unique going on for every creature – there is no boring rehash of old tricks in this book. That tentacley ambush-predator cactus you’ve seen done before? Well, it can generate a lethal aura of spikes by shooting them all at once in a pinch. That undead, doomed to wander the desert? Let’s just say that it can be used in Ravenloft sans modification, since it requires brains to defeat it. The second component that sets this apart is that, much like the Southlands-book, it borrows heavily on real world mythology and adds a unique spin to it – Mechuitl and Camazotz, for example, are statted as full-blown demon lords – including e.g. information on Camazotz in the underworld… Similarly, monster tropes are combined with great panache with Midgard flavor – Clockwork Shabti and Ushabti, for example tie in perfectly with the gearforged concept, while the types of tosculi and their master, dread Arbeyach, prince of swarms also get their due. Speaking of resonance with real world myth – if you’re familiar with Prester John’s myth, you’ll be like me and grin from ear to ear upon seeing the Blemmyes statted. The lightning-infused swarm “Bolt of Ekwanes” similarly resounds with a deep pulse of the familiar and yet unique. Fans of ancient mythologies will also cheer at the rendition of noble Buraqs, while drought swallows threaten the land and well-being of those foolish enough to attract their attention. Salt-devils scour the lands and demonic idolic deities await to be unearthed, while owl-headed harpies prey on the travelers. Intelligent ambush predator spiders called J’ba Fobi or the smoke-lions mngwas, carnivorousnandi bears or an ooze camouflaging as whole oasis – the breadth and depth of adversaries and creatures covered herein is wide indeed. Perhaps you want a pygmy trumpeteer elephant companion? Heck, even the tired old desert worm gets a new twist, with Sathaq worms sporting a pain-inducing aura and a hunting style based on dragging foes beneath the sands. Even the classic hybrids that in earlier days sometimes ended up being less than interesting have great representations herein – the lethal serpopard (serpent-leopard-hybrid) is a brutal foe, while an orangutan-choker hybrid should, by all accounts, end up on a ridiculous monster-list…but it does work! Insectoid Xhkarsh can afflict their victims with oracle curses and creatures mentioned in the great setting book, from the twisted vine lords to the arcane wasting-bearing intelligent white apes resound with themes of our collective cultural consciousness. The mythic Southlands titans do sport notes on words of power (and an optional, non WoP-array of SPs) while the wakane, a feathered pterosaur, is particularly feared for sinking boats – have I mentioned the huge, burrowing pitcher plants masquerading as an oasis, commanding whole swarms of its rootlets to defeat resilient prey? There is a lot of downright inspired material to be found herein and not one of the creatures in this book felt lazy or bland. Editing and formatting are top-notch – while e.g. MR is not capitalized in a statblock and while I noticed some small hiccups, overall, the book is solid. The statblocks I checked sported no glaring glitches. Layout adheres to a gorgeous two-column full-color standard and the pdf is fully bookmarked. The book has a huge selling point: The artwork is absolutely fantastic. original and truly evocative, full-color artworks for all creatures are provided and they are downright baffling, eclipsing even most 1st party bestiaries. Some of the artworks are so beautiful, they make you immediately want to use the creature they represent – and this holds true for just about all of them. Look at the cover: This is the level of awesomeness you get throughout the whole book. Here’s the awesome thing, though: As a long-time supporter of Kobold Press, I have, time and again, bemoaned the fact that some of the truly astounding full color pdfs were translated “only” into b/w-print copies. 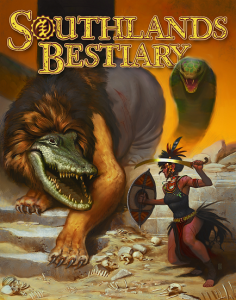 Not so here: The Southlands Bestiary’s print version is a truly gorgeous full color softcover that features thick, glossy paper and thus is a joy to simply flip open – if you can, get the print edition. Kristian Ahonen, Eric Anderson, Anonymous, Joshua Banks, Wolfgang Baur, dpb, Clinton Boomer, Marina de Santiago Buey, Angelica Burns, Jarrod Camiré, Aaron Cheung, Jim Davis, Lee DeBoer, Dan Dillon, John Doh, Chris Doyle, Harold Farmer, John Foster, Erik Freund, Leonard Grand, Amanda Hamon Kunz, Andrew Harshman, Jacob Haywood, Steven T. Helt, Jeffrey Hersh, Andrew Hind, Richard Iversen, Alex Kanous, Henry S. Kurtz, Richard Lawson, Jeff Lee, Chris Lockey, Ari Marmell, Ben McFarland, Jesse McGatha, Brett A. McLean, Brian Wiborg Mønster, Matt Morrissette, Robert H. Nichols, Stacy Nichols, Kalervo Oikarinen, Gunnar Ólafsson, Richard Rossi, Stephen Rowe, Adam Roy, Wendall Roy, Matt Rupprecht, Allen F. Schell, Brian Suskind, Troy Taylor, James Thomas, John Tolios, James Whittaker, Clarence Wisdom, Henry Wong – in spite of the established names among these ladies and gentlemen, one would expect quality to fluctuate. At least as far as I could tell (or where it would become jarring or problematic for the GM), I could not observe any tendency like that – Ben McFarland, Justin Riddler, Alistair Rigg, Brian Suskind, Jason Nelson and Amanda Hamon Kunz have done a glorious job reviewing, editing and developing these creatures – and the effort show. This is a superb bestiary, perhaps one of the most compelling ones I’ve read all year. Even if you’re not interested in Midgard or Southlands, I very much recommend you get this gorgeous tome – this is a glorious bestiary and well worth 5 stars + seal of approval as well as nomination as a candidate for my Top Ten of 2015. You can get this glorious bestiary here on OBS and here on d20pfsrd.com’s shop!